This Grapefruit Mimosa gives the classic Mimosa (made with orange juice) a new twist. All photography courtesy TexaSweet Citrus Marketing. America is the world’s largest consumer of grapefruit, with large commercial groves in Arizona, California, Florida and Texas. But the grapefruit’s ancestor, the pummelo (also pomelo or shaddock), comes from far away—it’s native to Malaysia and Indonesia. Pummelo seeds were brought from the East Indies to the West Indies in 1693 by an English ship commander. The grapefruit may have been a horticultural accident or a deliberate hybridization between the pummelo and the orange. The original grapefruit was about the size of an orange. It was originally called both “forbidden fruit,” and the “smaller shaddock,” after Captain Shaddock, who brought the seeds. The grapefruit arrived in the U.S. in 1823, but it was not immediately popular; the thick skin was unusual and an impediment. But the tree thrived, and its name evolved in English based on how it grows: in grapelike clusters. In 1870, the large, golden clusters on a tree he passed attracted John A. MacDonald, who lived in Orange County, Florida. MacDonald established the first grapefruit nursery. Florida’s first shipment of grapefruits to New York and Philadelphia, in 1885, generated interest and helped create the commercial grapefruit industry. By the late 1800s, grapefruit trees were being cultivated in the southern part of Texas; by 1910 grapefruit had succeeded in the Rio Grande Valley of Texas, as well as in Arizona and California. 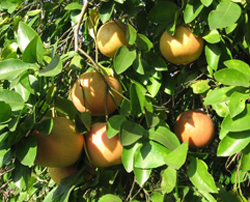 The pink grapefruit and other varieties were developed. In Jamaica, the grapefruit was crossbred with the tangerine to produce the ugli (which is indeed ugly), a sweeter fruit that the locals prefer. In 1929 a Texas citrus grower discovered a mutated red grapefruit growing on a pink grapefruit tree, which became the Ruby Red cultivar. Clusters growing like grapes earned grapefruit its name. 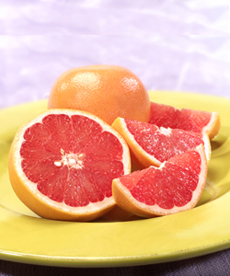 Grapefruit has been a household favorite in the U.S. since the 1940s. In the U.S., the peak season for grapefruit is October to June; Florida and Texas groves bear fruit beginning in October, and Arizona and California chime in in January to June. Because grapefruits are so popular, they are imported in the off-season. As with almost all products, commercial growers focus on developing fruits that are larger, more uniform in size, more attractive color and with fewer seeds. Unfortunately, flavor is sacrificed to achieve more commercial properties. The heirloom varieties were far tastier than today’s cultivars. If you can find any, grab them up. The fruit should be firm and springy. The heavier the grapefruit, the juicier it is. While grapefruits look attractive in a basket on the counter, the best place for them is the refrigerator. A slight chill also brings out more flavor. Don’t buy more than you need: Consume grapefruits within two weeks. While most people don’t think of grapefruit as a hand fruit (something you’d eat out of hand, like an apple), try smaller grapefruits as a hand fruit. They’re no harder to peel than an orange!